Researchers at Cambridge University’s Computer Laboratory have developed an app that uses smartphone data to track happiness. 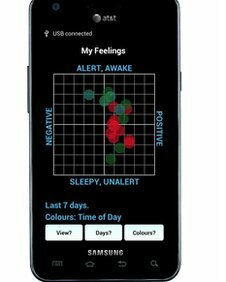 EmotionSense collects information about time of day, where the users are, and how many people they’re communicating with. It then combines this data with the user’s own report on his or her mood. When the app is opened for the first time, a sensor that tells the researchers what time it is is then unlocked. The app spends roughly a week collecting data from this sensor and testing it against the user’s emotional state. Next the user is asked to complete a short life satisfaction survey, which unlocks a new sensor. It takes about eight weeks to unlock all the sensors. These provide information on location, the number of texts people send and the calls they make, and how much they are interacting with their mobile phones. It has been designed as ‘a journey of discovery’ for users, giving them a step-by-step guide as to what might be influencing their mood swings, says lead researcher Dr Neal Lathia. “This helps us understand both how a person perceives things and how they are actually behaving,” he adds. Users input their own perception of their feelings using a system which has been designed by psychologists. At different times of the day the app sends the users a notification asking them about their mood. Users then enter their responses on an ‘emotion grid’ that has two axes. The first records negative to positive feelings, and the other records activity. It is hoped the app can be used by doctors as a therapeutic tool, as well as by individuals to work out the times when they are most stressed, for example. “Most people who see a therapist only have an appointment once every fortnight,” says Dr. Lathia. “Many, however, keep their phones with them most of the time. In terms of sheer presence, mobiles can provide an ongoing link with a person”. Useful or not? Like CBT, it may work for some people. But it’s a tool, it isn’t a recipe for happiness.